Hello and welcome to the 241st installment of the SWD. Harakat Nour al-Deen al-Zenki and Hayat Tahrir al-Sham clashed in a number of localities in the western Aleppo countryside, such as; Taqad, Tadil, Al-Sahara, and Rahab. The most intense clashes were led in Al-Abzam, Kafr Naha, Al-Sheikh Suleiman, and 111th Regiment areas. Harakat Nour al-Deen al-Zenki declared general mobilization in areas under its control in Aleppo, however, that did not stop Hayat Tahrir al-Sham from fully capturing Al-Abzam. Hayat Tahrir al-Sham brought reinforcements from the Darat Izza’s 46th Regiment base for the battle of Al-Abzam. Demonstrations were held in several rebel-held towns in western Aleppo countryside calling for an end of rebel infighting. Demonstrations took place in Al-Atarib, Al-Abzam, Urum al-Kubra, and Killi. Rebel fighters reportedly opened fire on demonstrators in Urum al-Kubra, injuring 14 civilians. Both Harakat Nour al-Deen al-Zenki and Hayat Tahrir al-Sham mutually accuse each other of committing the act. Hayat Tahrir al-Sham reportedly arrested Osama Mohammed, preacher and imam of a mosque in Aleppo’s countryside. Mohammed was arrested due to his close relationship with Harakat Nour al-Deen al-Zenki. Liwa al-Farouq and Saraya al-Aqsa defected from Hayat Tahrir al-Sham, due to latter’s recent targeting of rebels and civilians. Hayat Tahrir al-Sham’s Ibaa News Agency announced Al-Rashadiya and Tel al-Sawan as recaptured from the Syrian Arab Army and allies. According to the commander in Hayat Tahrir al-Sham, Abu Faisal, a group of HTS‘ inghimasi (suicide fighters) stormed Al-Rashadiyah and clashed with SAA for several hours before capturing the locality. Abu Faisal stated that around 20 SAA and allied soldiers were killed, and three vehicles seized. Hayat Tahrir al-Sham took responsibility for a VBIED attack against Russian Army’s convoy in Bustan al-Basha area of Jableh, near Hmeimim Air Base. Official in Hayat Tahrir al-Sham, Abdul Aziz al-Mahmoud stated that the attack killed and wounded dozen of Russian and Syrian soldiers. Harakat Nour al-Deen al-Zenki officially “declared war” on Hayat Tahrir al-Sham in a video statement by HNDZ‘s deputy leader, Ali Saido. Saido stated that the war was started by HTS and it will continue until the defense of religion and revolution. Harakat Nour al-Deen al-Zenki’s spokesman, Captain Abdul Salam Abdul Razak claimed that Hayat Tahrir al-Sham’s fighters stormed Bab al-Hawa hospital and captured five wounded HNDZ‘s fighters, while detaining several others in the hospital. Hayat Tahrir al-Sham arrested official of IS-linked Liwa al-Aqsa (Jund al-Aqsa), Abu Abdul al-Wakil al-Jazrawi in Nayrab. Al-Jazrawi is being accused of leading several cells against the HTS and assassinating Abu Malik al-Tali’s son. Turkish border guards opened fire on a group of civilians trying to illegally enter Turkey near the village of Al-Duraiya in Darkush area. Three civilians were killed and four injured by the Turkish Gendarmerie. Two children were killed and a third one injured when a landmine exploded in the village of Tal Salmu. 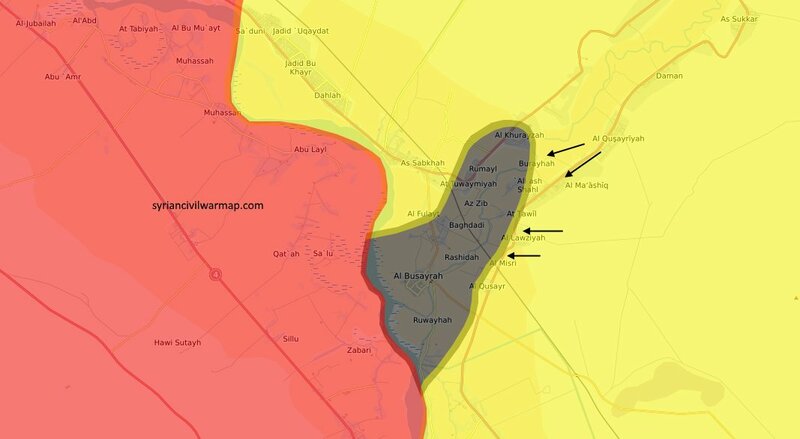 Syrian Democratic Forces reportedly captured Al-Maashiq, Al-Lawziyah, Al-Misri, and Burayhah from the Islamic State, southeast of Deir al-Zour. During this push, at least eight Islamic State’s fighters were reported as killed. On a front north of Al-Bukamal (Albu Kamal), SDF reportedly captured Kishma oil field from the Islamic State. Reports about Islamic State still controlling Al-Bukamal, at least partially, started to appear today, mainly due to the lack of footage from the city. Ministry of Defence of the Russian Federation issued a statement today regarding the Syrian Arab Army’s capture of Al-Bukamal, also stating that demining operations started in the city. Islamic State and Syrian Arab Army continue to clash in the area south of Al-Mayadeen, the former’s news agency reported death of ten latter’s soldiers and capture of one element. Additionally, Amaq released another statement regarding this area, reporting destruction of two SAA‘s tanks with anti-tank guided missiles. South of Al-Bukamal, Amaq reported destruction of a truck carrying SAA‘s soldiers with an anti-tank guided missile. Syrian Arab Army’s artillery shelled Ain Terma, Jobar, Kafr Batna, Saqba, and Arbeen, causing material damage in the localities and several injuries among the civilians. Journalist Imran Awiti, known as Omar al-Joulani, was found dead after being kidnapped by unknown gunmen in Jasim. Awiti’s body was found with traces of torture. The rebel-held part of Daraa governorate has been hit by the wave of assassinations lately, but the usual targets are the Free Syrian Army’s commanders. One person was killed and another injured by an improvised explosive device, which exploded on the road between Al-Karak al-Sharqi and Rekhum. Islamic State’s Amaq Agency claimed destruction of Iraqi Army’s Humvee with an improvised explosive device in Al-Farahiyah area, near Al-Ishaqi. Between the 6th and 9th of November 2017 CJTF-OIR has conducted 11 strikes in Syria. CJTF-OIR‘s main focus in Syria at the moment is Deir al-Zour region where they did ten strikes supporting SDF‘s operations against IS destroying an IS line of communication, four fighting positions and an IS vehicle. Other area where one strike occurred is Al-Bukamal (Albu Kamal) destroying four IS logistics hubs. Full report on CJTF-OIR strikes conducted in both Syria & Iraq can be found here. Islamic State reportedly killed 14 Taliban fighters, including commanders in yesterday’s clashes in Wazeir Tinki area, Khokianu Directorate. Islamic State’s inghimasi (suicide fighters) launched an attack against the Egyptian Army’s position yesterday, south of Al-Shakh Zawid in the northern Sinai. According to Amaq, IS killed an officer and several Egyptian soldiers in the attack.